Fishing-- The River Lot is one of the finest carp and catfish rivers in France. It is famous for its record carp (approaching 30 lbs!). Anglers may fish at night all year. Note, to preserve fish populations the Lot is a ”no kill” river. Horseback riding - This is wonderful riding country, and several stables offer a variety of riding packages, by the hour or by the day-- even overnight! The nearest stables are about 15 minutes away in Cabrerets. 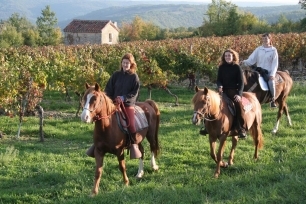 Chez Richard et Nanou in Belfort du Quercy, Near Lalbenque, you can hire a horse by the hour or the day, or take a “Rando-bivouac,” a guided afternoon ride followed by a night out under canvas(Tel. : 0565 24 72 48). Climbing – those limestone cliffs attract climbers of all levels and all ages! Ask Kapalca. Concerts – Cahors hosts the Festival of the Blues every July. If you prefer classical music, there is the famous festival in St. Céré and also one in Limogne every summer. Tennis - There is a court in Tour de Faure which may be rented by the hour. Inquire at the village store. 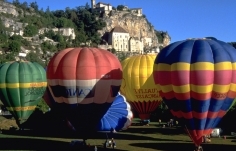 Ballooning – there is a hot air balloon competition in September in Rocamador. Birdwatching -St. Cirq Lapopie appeals to ornithologists. Since spraying is prohibited, more birds are present than you may be accustomed to hearing. A list of birds in the area is available online. There are fine walks from and near the village, many of which offer spectacular views over the Lot River and valley. Especially fun is the walk along the old river Tow Path below the village.